“Green city planning to create green roofs, green parks and deployment of green assets in places where we are worried about heat effects is necessary,” said Jessica Hellmann, director of the Institute on Environment from the University of Minnesota to keep climate change at controllable levels. She stressed in no uncertain terms the need to uphold the international Paris climate agreement to limit global warming to 2 degrees centigrade (3.6 degrees Fahrenheit). “We just wrote a paper recently about using weather models in the Chicago land area and what would happen if you could turn 25 percent to even 100 percent of all roofs and make them green. How much would it reduce downtown temperatures in the event of extreme temperature scenario?” said Hellmann, adding that their study revealed how temperature plummeted by several degrees Fahrenheit. Hellmann and other climate experts addressed local, national and global impacts of the “Water-Energy-Climate Nexus” at Northwestern University’s recent Climate Change Symposium. The Institute for Sustainability and Energy at Northwestern anchored the symposium to water and energy resources, keys to climate change solutions. ISEN Executive Director Michael Wasielewski said in an interview that this symposium brought together policy-makers and students as well as scientists and so it serves to benefit researchers both from Northwestern University and other institutions tremendously. Wasielewski said he hopes that the conference is a conversation starter that allows individual researchers to get together and make connections. “This will ultimately lead to new projects and new solutions to address these problems,” he remarked, highlighting the fact that technology curbing climate change may come from seemingly unrelated areas of science and engineering. The event hosted multiple speakers from universities and agencies across the country. Diana Bauer, director of the Office of Energy Systems Analysis, at the Department of Energy (DOE) said water is essential for power generation and advocated accurate power/water models as critical to energy policy and decision-making. “The DOE has about 18 departments that focus on water and so we are focused on energy and it’s connection to water, “ said Bauer. Mark Johnson, director of the Office of Advanced Manufacturing of the Department of Energy said,” What our department focuses on is that if the scientists develop new technologies such as applications for clean energy, how do we get them out of the labs to the marketplaces?” He spoke about DOE initiatives, to support partnerships between universities and industries, emphasizing the need for basic and applied sciences to collaborate and come up with energy efficiency solutions. Energy efficiency and alternative energy are part of the quest by scientists worldwide to lower fossil fuel emissions of carbon dioxide, a greenhouse gas responsible for warming our planet. As a chemistry professor, Wasielewski and his research group explore producing renewable energy sources such as solar fuels. In particular, his research focuses on artificial photosynthesis that uses solar energy directly to produce solar fuel. “The way we do that is by targeting solar energy to catalytically split water to generate oxygen and hydrogen,” he said. Wasielewski’s team also experiments with the use of solar energy to catalytically reduce carbon dioxide to liquid fuels, which could be easily stored. “It is an instance of worldwide effort in that area because the idea of directly using solar energy to drive carbon dioxide reduction to liquid fuel that can be used for transportation is a long-term goal of many researchers,” he said. The symposium featured talks on essential policies and reforms to target energy challenges. “Hydraulic fracturing is one energy field that requires more regulation,” said Joseph Ryan, a professor of Civil, Environmental and Architectural Engineering at the University of Colorado, Boulder. Ryan’s research, funded by the National Science Foundation, is studying the impact of hydraulic fracturing on water pollution locally in Colorado. He said he believes that regulators can use this information as a decision analysis tool since water pollution isn’t the only problem related to fracking as climate change threatens increased water shortages in parts of the U.S.
Ryan’s research team looked at water acquisition practices for oil and gas fracking in two Colorado counties – Weld and Garfield. He showed that at least in Weld County, not all of the hydraulic fracturing fluid injected to drill oil and release hydrocarbons, flowed back up and continued to stay underground. But why would this be a problem? Ryan and his team analyzed the chemical compounds used in the fracturing fluid at high pressure to break up or “fracture” rock and extract oil. They focused on organic compounds in the fluid and found a large number of them – a total of 659 including guar gum, methanol, ethylene glycol among others. Many are toxic and some are also mobile and persistent, a subset of the 659 compounds that do pose a risk if they are released, Ryan said. “We should be worried about those” due to potential contamination of groundwater supplies, he said. The additional risk here is that a few of the compounds are not monitored. As a result, Ryan and his colleagues suggested two major recommendations to Colorado regulators. First, monitor these compounds that are not commonly measured and “could be regarded as smoking guns that could implicate some contamination episodes,” said Ryan. Second, remove the hazardous compounds and increase the efficiency of fracking. “Unfortunately the oil and gas companies have not put a lot of effort into making a ‘greener’ fluid since it’s expensive and they do a lot of experimentation on the field. There’s no work on how these compounds might affect things from a laboratory perspective,” Ryan said. Acknowledging the limitations of his study, Ryan said that not all geological considerations are transferable. However, the work on improving air quality and the treatment of wastewater coming out of these oil and gas wells are widely applicable, said Ryan – adding that each state is better off forming their own regulations. A controversial EPA report released in 2015 on the assessment of potential impacts of hydraulic fracturing for oil and gas concluded: “We did not find evidence that these mechanisms have led to widespread systemic impacts on drinking water resources in the United States.” Scientific studies, such as the one from the University of Colorado, albeit alarming, are limited to a local scale affecting a smaller percentage of people. Should government regulatory agencies take action or dismiss local studies for not being ‘widespread’ and ‘systemic’ enough? Is there a magic number of people impacted that should prompt us to take action? “This is something we as a society and regulators have to decide,” said Ryan. 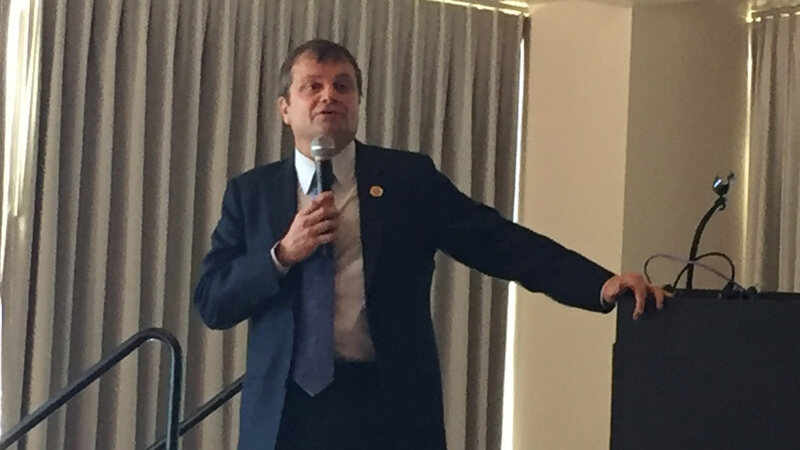 As for instituting climate change regulations, Chicago Congressman Michael Quigley (D-5th), the keynote speaker at the symposium, enumerated some of the hurdles he faces. “I serve with [some] people who don’t believe in climate change and evolution,” he said, citing his lack of a necessary quorum at times to carry out policy reforms. In the face of this opposition, Quigley lamented that despite being served by one of the most progressive presidents on environmental issues, not much has been accomplished in addressing the problems. “The frustrating part is that you are not even seeing climate change issues being addressed in the debates at all, since debates have become reality TV,” he commented. As a ranking member of the Sustainable Energy and Environment Coalition (SEEC) at the House of Representatives, he strongly advocates policies for regulating environmental issues, limiting the threat to our climate. Quigley urged the scientists to synthesize their results and communicate to lay audience in an accessible manner so that it could be translated through our political system back through an active Congress. ”Change comes when the base core of the constituency say otherwise,” remarked Quigley, as part of his closing statements.